In the above photo you can see the front bumper of which has some light scratch damage and a scuff on the wheel arch, probably caused by driving through a hedge. Similar damage is sometimes caused by putting cardboard boxes on the boot of your car, or by washing it with a cloth or brush which is too harsh. 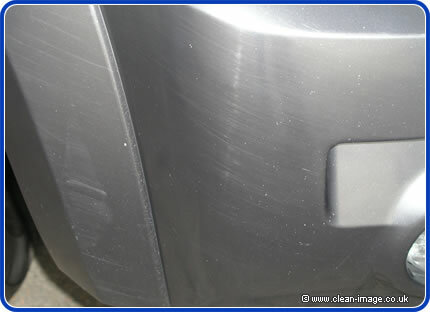 Usually these kind of scratches will need buffing with rotary buffing machine, but in this case, Gary felt he could remove them with a twin headed random orbital polishing machine. Although this takes longer than our normal buffing machines, it has smaller heads which are able to get into hard-to-reach areas, and because it uses oscillating heads there is no danger of burning the paintwork or leaving swirl marks. As you can see, the scratches and scuff were completely removed. 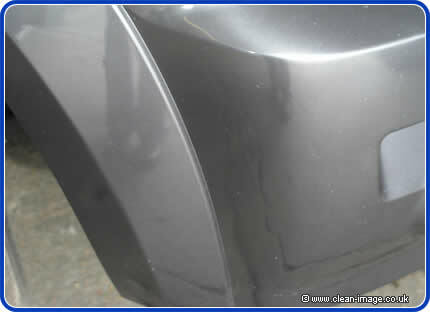 For more information on scratch removal, please see Paintwork Restoration. See our Porsche Restoration Article for an example of how we can take a car in really poor condition and make it look like new.. Unfortunately, no amount of polishing can remove the stone chips or deep scratches which have penetrated the base coat of paint, for more on this, please view our Stone Chip Article.